'....an ounce of prevention is worth ten pounds of cure.' No more effective application of this adage than in fire safety. Protect your home and loved ones. ​* HOME FIRE SAFETY TIP #1: Clean your dryer filter with each usage. Clean your dryer vent regularly. Never leave a dryer unattended. When good dryers go bad! * HOME FIRE SAFETY TIP #2: CLOSE THE DOOR BETWEEN YOU AND THE FIRE , AND THE OUTSIDE ...IF POSSIBLE. INSTALL FIRE RATED DOORS. Do not compromise the fire safety of any door...by installing a cat door for example. 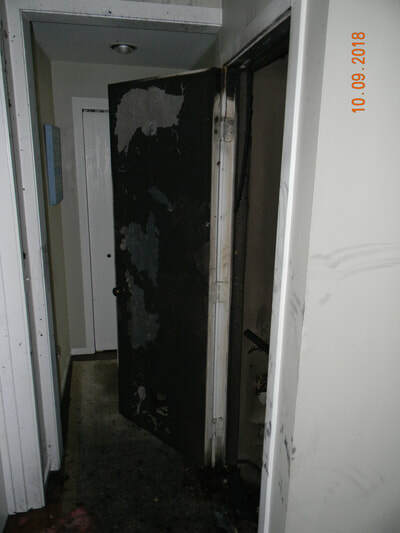 Protection from a fire rated door. ​*HOME FIRE SAFETY TIP #3: MORE THAN HALF OF ALL HOUSE FIRES START IN THE KITCHEN. - Stay in your kitchen while cooking. Pay attention. - Watch your clothing, children and towels around the stovetop. Never leave pan handles to hang off stove top. - Of course have a fire extinguisher handy. Remember 'P.A.S.S. '...Pull, Aim, Squeeze, Spray...(sweep the base of the fire). ​- Never throw hot grease in the garbage can! - Never transfer flaming alcohol from one pan/pot to another! - Never use water on a grease fire! You will turn a pan fire into a house fire. - Never pick up the flaming pan to remove from the stove! Leave it be. - Shut off the heat on the stove and oven...keep the oven door closed. If possible, use a mitt and cover pan with a lid. - Use baking soda on the fire or use your fire extinguisher. Get everyone else out of the kitchen with a phone ready. - If the fire is not controlled, get everybody outside, close the door if possible and call 911. * HOME FIRE SAFETY TIP #4: PREVENT ELECTRICAL FIRES. Electrical fires (Fires started by electricity) are one of the top causes of house fires. Electrical fires are particularly dangerous requiring precautionary attentions as electrical loads are alway present in the home. Take the following steps to protect your loved-ones and home. FOCUS #1: Maintaining Electrical Plugs, Outlets and Cords. - Make sure all outlets are fitted and tight to the wall. Nothing loose, broken or missing. Fix it and prevent shock or electrocution. - Never tamper with plugs or force into an outlet. Don't pull a plug from the cord... both will wear out. ​- Use surge protectors for multiple plugs. Don't overload, never more than 3 plugs per power bar. Plug room space heater directly into an outlet, avoid extension cords for heaters. Make sure outlet can handle heater loads. - Replace frayed/cracked electrical cords. Avoid water (including hair dryers and other appliances near sinks) and placing cords under carpets. Never staple or nail cords to walls/floor. - If fire starts, shut off power if possible. Use Class ABC extinguisher. Don't use water, you will spread the fire or may get electrocuted. 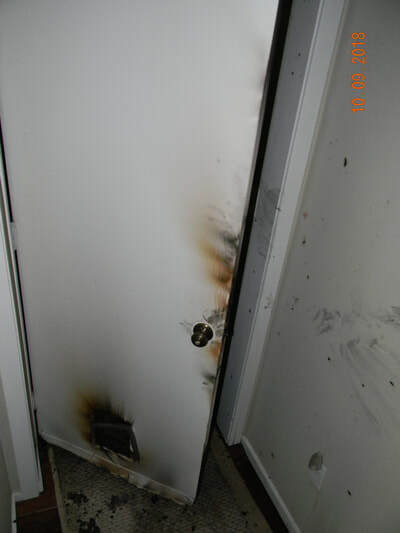 If fire is not contained within 5 seconds, get out, close the door and call 911. - Always follow Manufacturer's Instructions. Never use defective appliances. - Get use to disconnecting small appliances when not in use, especially those with heavier loads: toasters, heaters, hair dryers. You will also save electricity. - WATT THE HECK! Make sure you match bulb wattage with fixtures. Make sure bulbs are screwed in securely, otherwise the bulb can overheat. Don't overload circuits. This is especially important with dual level (high/low) room heaters. - Make sure your outlets have Ground Fault Interrupters (GFCI), especially in the kitchen, bathroom, laundry room, outside outlets....well mostly everywhere. Have them tested regularly. - Pay attention to signs of faulty wiring: lights flickering; funny noises; heat from switches, fuse box, wires, etc. ; circuit breakers or fuses that trip constantly. - When in doubt use a qualified electrician. Electrical fires, shocks and electrocution are no fun. SEE PICTURE BELOW. Uh oh! That's not good. 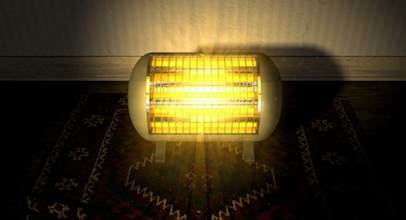 * HOME FIRE SAFETY TIP #5: USING SPACE HEATERS SAFELY. It's getting cold outside. Space heaters can help warm a room quickly. BUT, they can be as dangerous as they are convenient. - Purchase only space heaters that have been safety tested and UL approved. - Make sure the unit is equipped with an emergency tip-over shut-off feature and heating element guards. - Read and follow all of the manufacturer’s instructions for operation and care. - Before using a space heater, make sure your smoke and carbon monoxide detectors are in good working condition. - Check to make sure the heater is clean and in good condition, and have all problems professionally repaired. - Place the heater out of high-traffic areas and on a level, hard, non-flammable floor surface—NOT on carpets, furniture or countertops. - Space heaters have one purpose —to provide supplemental heating. Never use them to thaw pipes, cook food, or dry clothing or towels. - Remember to keep space heaters at least three feet from combustible liquids like fuel, spray cans and paint, as well as flammable items such as draperies, blankets and sofas. - Never allow pets or children near an electric heater. Accidental contact could result in serious shock or burns. - Do not overload circuits. Never use extension cords or multiple plugs with a space heater, and make sure the unit is not plugged into the same circuit as other electric appliances. - If your space heater is plugged into a ground fault circuit interrupter (GFCI) and it trips, don’t assume there is something wrong with the GFCI. Immediately stop using the heater until a professional can check it— if not, a serious shock could occur. - Never leave space heaters unattended. Turn off your space heater and unplug it before leaving the room or going to bed. Replace older space heaters with newer, safer models. > Have and practice a Family Plan. >Know how to use your fire extinguisher for small, contained fires only. "P.A.S.S"
> 'Close the Door' between you and the fire, if possible.